Abstract. Alluvial plains are formed with sediments that rivers deposit on the adjacent flood-basin, mainly through crevasse splays and avulsions. These result from a combination of processes, some of which push the river towards the crevasse threshold, while others act as triggers. Based on the floodplain sedimentation patterns of large rivers in the southern Amazonian foreland basin, it has been suggested that alluvial plain sediment accumulation is primarily the result of river crevasse splays and sheet sands triggered by above-normal precipitation events due to La Niña. However, more than 90% of the Amazonian river network is made of small rivers and it is unknown whether small river floodplain sedimentation is influenced by the ENSO cycle as well. Using Landsat images from 1984 to 2014, here I analyse the behaviour of all 12 tributaries of the Río Mamoré with a catchment in the Andes. 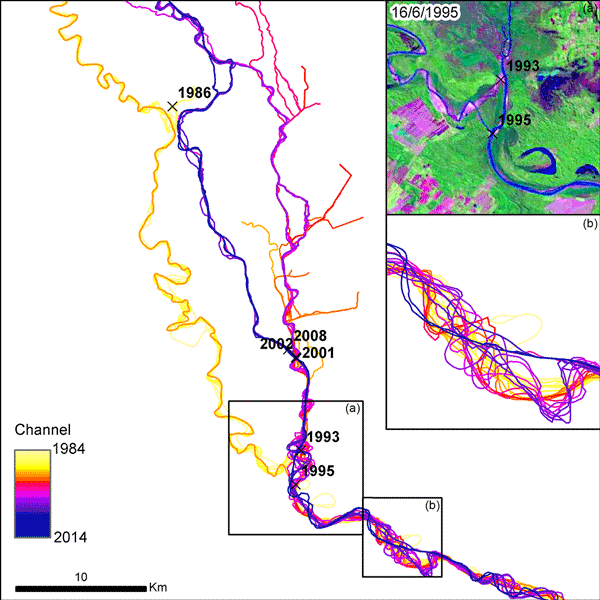 I show that these are very active rivers and that the frequency of crevasses is not linked to ENSO activity. The data suggest that most of the sediments eroded from the Andes by the tributaries of the Mamoré are deposited in the alluvial plains, before reaching the parent river. The mid-to-late Holocene paleo-channels of these rivers are located tens of kilometres further away from the Andes than the modern crevasses. I conclude that the frequency of crevasses is controlled by intrabasinal processes that act on a yearly to decadal timescale, while the average location of the crevasses is controlled by climatic or neo-tectonic events that act on a millennial scale. Finally, I discuss the implications of river dynamics on rural livelihoods and biodiversity in the Llanos de Moxos, a seasonally flooded savannah covering most of the southern Amazonian foreland basin and the world's largest RAMSAR site. How to cite: Lombardo, U.: Alluvial plain dynamics in the southern Amazonian foreland basin, Earth Syst. Dynam., 7, 453-467, https://doi.org/10.5194/esd-7-453-2016, 2016. 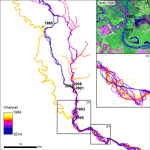 This paper analyses the behaviour of 12 tributaries of the Río Mamoré and their influence on alluvial plain dynamics. These rivers are extremely active: between 1984 and 2014, 7 of these 12 rivers underwent a total of 41 crevasses and 29 avulsions. Most of the sedimentary load of these rivers is deposited on the alluvial plains before they reach the Mamoré. Crevasses and avulsions are not controlled by ENSO cycles, but rather are the result of intrabasinal processes.